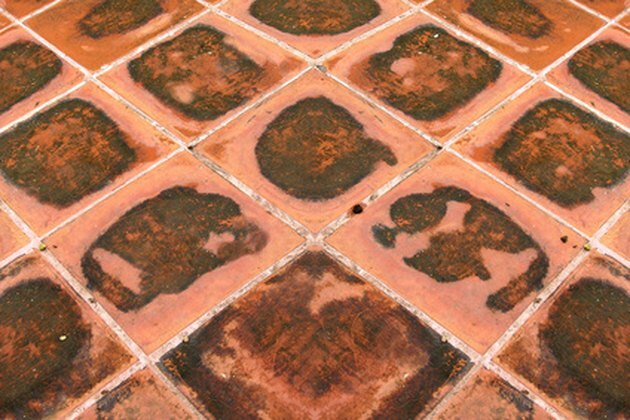 Painting outdoor ceramic tile can give the exterior of your home a whole new look. If you are the creative type, why not try decorating the tiles in different colors to create an overall color design effect, or stencil a pattern or simple design onto some of the tiles to give the new look some whimsy. Revamp worn outdoor tiles with exterior tile paint. Prepare your ceramic tile before applying primer. Clean your ceramic tile thoroughly using a mild abrasive such as a cream cleanser to remove any dirt, grease or mold. Rinse off the white soap residue with cold water. Clean the grout around the tile by applying a solution of bleach with an old toothbrush. Leave for 30 minutes. Wipe off with a damp cloth. Sand your ceramic tile to remove the shiny surface using a sheet of sandpaper or an electric sander. Wash the ceramic tile a second time, but use the recommended dose of sugar soap in a bucket of hot water to remove any remaining dust, dirt or cleanser residue. The tile must be very clean before applying the primer. Apply a thin coat of good quality glass or tile primer over your tile using a brush or roller. Allow the primer to dry for at least six hours before applying a second coat. Sand the tile lightly after priming and wipe away the dust. Paint your tile with an exterior ceramic paint. A brick and tile paint is a good option as it is protects the tile from the elements and is shower-proof after 30 minutes. Add thinner to your paint, if the paint is difficult to apply. Allow to dry according to product specifications. Re-grout around your tile to make your painted tiles look fresh and new. Robyn Tindle has been writing since 2007, having been long-listed for the Kings Cross New Writing Award with "Shadows in a Shoebox." She produced a stage production of "Stand" at the Barons Court Theatre, London, after the short was produced by Northern Stage and produced "StoneColde" at Newcastle Keep. She gained a Bachelor of Arts Honors Combined Studies Degree at the University of Northampton.